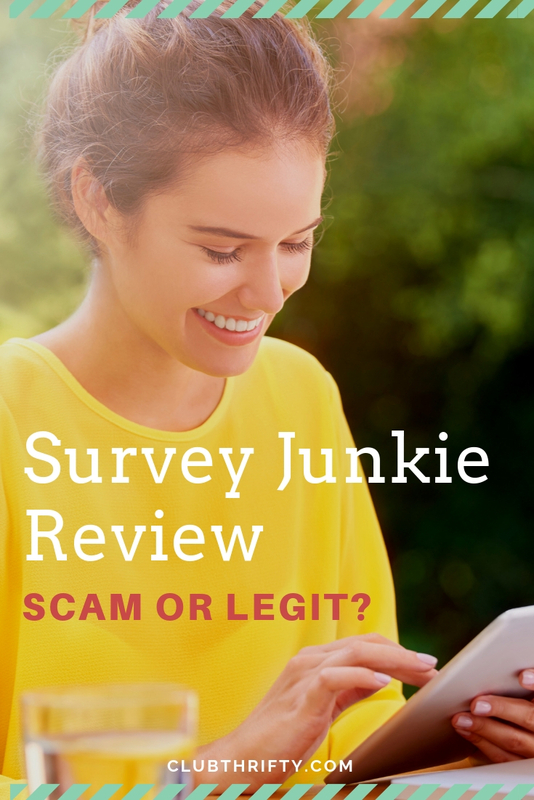 Is Survey Junkie a Legitimate Way to Make Money? Who is Survey Junkie Best For? Who Should Avoid Survey Junkie? The Verdict: Is Survey Junkie Real? Survey Junkie is legitimate way to make money through taking surveys, but you shouldn't expect to get rich from it. Read our review to see if it's worth it! Have you ever spent a lazy day around the house wishing you could make money while you relax? Well, as it turns out, there are plenty of fun ways to earn extra money for very little effort. That’s right, you can hop online when you’re not busy, and start earning right away with Survey Junkie! Just about everybody is looking for ways to earn more money. But obviously, that’s tough to do if you already have a full-time job and very little free time. That’s where survey companies can be a good fit! To understand what their potential customers are looking for, many companies gather opinions about their products through market research – which includes things like surveys and focus groups. Founded in 2013, Survey Junkie helps companies get the consumer opinions they need to better serve their customers. Companies connected with Survey Junkie are searching for people just like you to provide opinions. Whether it’s on vehicle satisfaction, electronic innovations, makeup products, or advertising effectiveness you can offer your unique viewpoint…and get paid for it! Survey Junkie’s members earn real money just by doing the simplest tasks – taking surveys! You simply pick which surveys you want and answer a few easy questions about your life and your experience with specific products. Sounds pretty simple, right? Absolutely, Survey Junkie is legit! 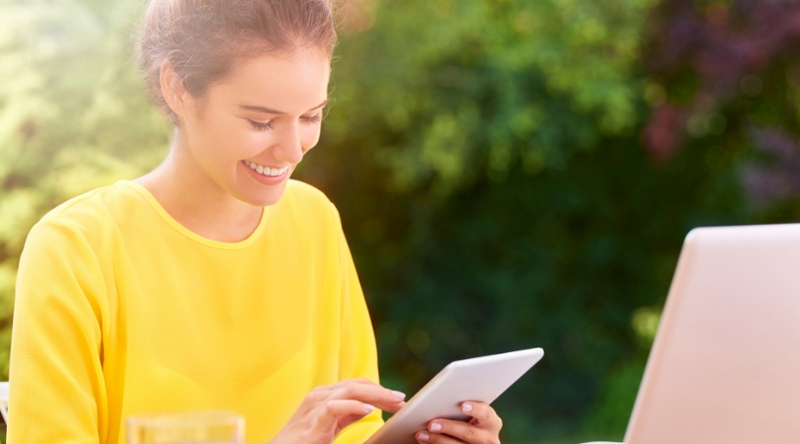 It’s a thriving online community of more than 3 million members. Of course, it’s important to temper your expectations. The money you make won’t enable an early retirement by any means, but it can pad your vacation fund, help you save for holiday gifts, or even help pay off a loan a bit faster. Even if you only spend a few hours a month taking surveys, you’ll earn a few bucks you didn’t have before. Survey Junkie also pays users for participating in focus groups locally and virtually. Whatever tasks you opt for, you’ll earn cash for your time and effort. People often are suspicious of anything that appears to be too easy, and for good reason. Well, Survey Junkie is easy, but it doesn’t promise to make you wealthy. It does provide a way for you to make real money, though, and that is legitimate. Whether you just want a way to earn some “fun” money to spend or you want a way to make money and fill up spare time, Survey Junkie is one easy way to do it. 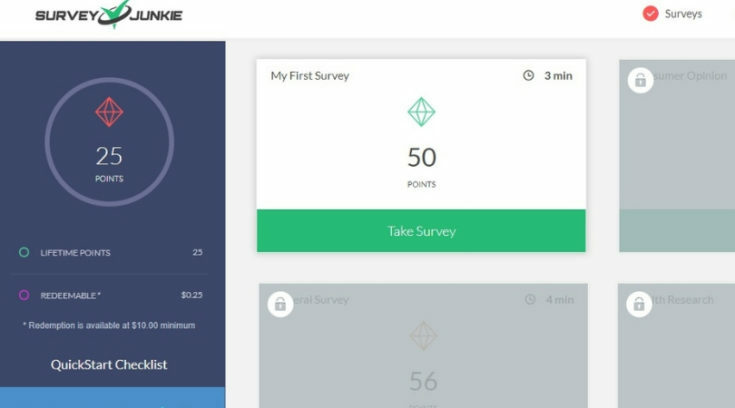 Survey Junkie is the real deal, and it’s totally free to join. So, if you want to start making money, check out the details below. Get Paid for Your Opinions – Get paid real money to give your opinion on products and services you use every day. Start earning with Survey Junkie here. Of course, taking surveys is your best bet when getting into Survey Junkie. It’s also super easy. Whenever you’ve got some downtime, just log into your account and see which surveys are available. Each survey listing includes the approximate amount of time it should take to complete as well as how many points it’s worth. Once you click on “Start Survey,” you’ll be directed to a few screening questions. These are simple things like your age and income level. Then, they move onto details that relate to the survey topic. If you fit the type of consumer profile they need, you’ll get to finish the rest of the survey. If not, you’ll still earn a couple of points just for giving it a shot. Survey topics vary, so you never know what kinds of questions you might answer. Sometimes you’ll even get to watch advertising videos and give your reactions. Survey Junkie awards points for your time, and it couldn’t be any simpler to calculate how much the points are worth in real money! Every point is one cent, so if you earn 50 points on one survey, you’ll make 50 cents. In addition to taking surveys, you can also build up your “fun” fund by taking part in focus groups. These give you a different way to give your opinion, and the payouts can even be higher than for traditional surveys. Of course, you’ll have to fit the target demographic (the ideal type of customer they need) to qualify, but if you do, you’re on your way to making some pretty easy cash. Let’s assume you sign up with Survey Junkie and start taking surveys. Each time you attempt or complete a survey, you’ll earn more points. Every 100 points is worth a dollar, so it really doesn’t take that long to start making money. Once you’ve accumulated a minimum of 1,000 points, you’re ready to cash out. One thousand points is the equivalent of $10. 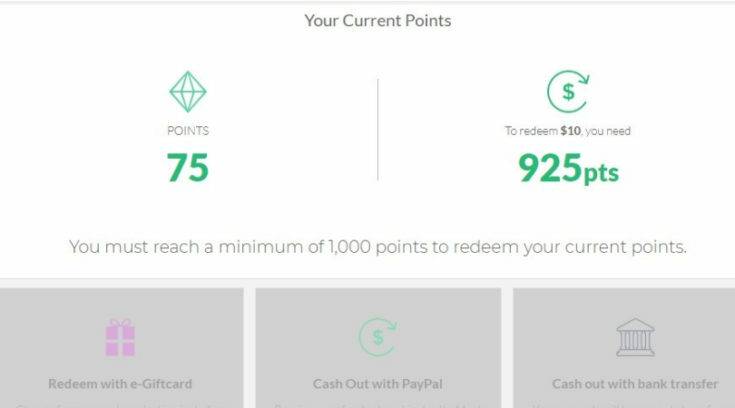 You can redeem your points through PayPal, which is secure and easy. They also pay via e-gift cards to popular retailers like Amazon and Target! Of course, Survey Junkie is fantastic because you can earn money from your couch. If you have a laptop and an internet connection, you can complete surveys. So, whenever you find some spare moments during your day, whether it’s while waiting in line at the DMV or watching TV at home, you could be earning money with Survey Junkie. Any device you can connect to the internet will give you a chance to earn. It’s perfect for those 5-minute unscheduled intervals. Plus, the questions aren’t difficult–you just have to say what you think of products and ads! Survey Junkie pays through some of the most well-known avenues around. You might choose PayPal gift cards, e-gift cards to Amazon, or gift cards to other huge retailers that you use. So, there’s no need to worry that you’ll be compensated with useless gift cards that you’ll never have a chance to spend! Some survey sites complicate things by including a ton of activities you can do to earn money. While this may sound great at first, it can make it hard to figure out what you’re doing. But with Survey Junkie, they’re all about surveys. There’s no need to decipher complicated rules on how to maximize your earnings. For example, some survey companies “pay” people through “offers.” In these instances, you’re required to sign up for an offer’s trial membership . With Survey Junkie, you don’t do offers, so there’s no hassle of trying to cancel before you get charged. There will be many surveys you won’t qualify for, but no worries! Every time you start the survey process and find out you don’t qualify to finish it, Survey Junkie will award you a small amount (usually 3 points) just for giving it a try! So, at least you get something for your time even if you don’t fit the qualifications for the survey. Take Surveys, Get Paid – Get paid real money for taking surveys when you create a free account with Survey Junkie! Get started here. It wouldn’t be a fair review to talk only about the benefits of Survey Junkie. So, here are a few things to consider as you think about whether to join. Surveys tend to fill up fast. – If you don’t check your Survey Junkie account often, you’ll probably miss out on a lot. You might also end up starting a survey only to find it’s already filled up–bummer! Surveys work best on a laptop. – While you can often complete surveys on devices like smartphones, it is easiest to do them on a traditional computer or laptop. That can make it a bit less convenient for folks on-the-go. You may not qualify for all surveys. – It’s pretty common to start a survey, answer a few initial screening questions, and be disqualified from that particular survey. So, you might waste a bit of time trying to get into a survey you can actually complete for the full point value. Survey subjects aren’t listed. – Related to the disqualification issue, the survey listings don’t include any information about the subject of the survey. So, you have no idea whether it’s a topic you might be interested in or have much of an opinion to offer. It would save some time if you could see in advance whether the survey topic is up your alley. You won’t get rich. – If you need a lot of money or a set amount of money coming in every week or month, Survey Junkie isn’t the best option. It’s great for extra money to help pay for special occasions, but it’s not life-changing money. People who need a little extra cash for little effort – Someone who only needs a few bucks here and there is perfect for Survey Junkie. People who have small windows of free time – Anybody can take surveys, even if they only have a couple of minutes open. People who like to give their opinions – If you enjoy giving opinions on ads, products, and services, Survey Junkie is a great place for you. Someone expecting to make money in their sleep – While Survey Junkie offers easy ways to make money, it doesn’t pay you for doing nothing. You actually have to spend some time to get surveys done. Someone expecting to get rich overnight – No, you won’t be able to fund an early retirement in Bermuda just by taking surveys. So, if you’ve got super-lofty expectations, it’s best to steer clear of Survey Junkie. As Survey Junkie’s tagline says, “We connect your voice to big brands – helping shape our world.” Whether you’re in it for the potential impact on consumer products or you just want the extra cash, taking surveys here offers flexibility and a little extra earning power. Survey Junkie is a legit company that pays real dollars to real people, but they don’t claim to make you rich in an instant. They do exactly what they say they do, which is send out surveys and pay you for completing them. It doesn’t get more straightforward than that! Of course, you also have set your expectations accordingly. Don’t quit your day job to join Survey Junkie. It’s a side gig opportunity that can help you earn a few extra bucks each month. Taking surveys can’t be your entire financial plan, but it can play a small role in helping you to build up your emergency fund, save for a vacation, or just have cash for takeout once in a while. So, if you’re looking for a new way to fill your wallet, Survey Junkie is a great place to start. Signup is quick and free, so there’s really nothing to lose by trying it out. After all, taking surveys while watching TV or relaxing at home is just about the easiest method of earning money there could be! Make Money with Survey Junkie – Want to make extra money from your couch? Create your free account at Survey Junkie and get paid real cash for your opinions! Get started here. Have you tried Survey Junkie yet? What’s been your experience? Let us know in the comments! PreviousDenver CityPASS Review 2019: Is It Worth It? Survey Junkie is OK but after receiving rewards of $280 all of a sudden I don’t qualify OR this survey is already full. I now average 2 -3 points per survey regardless of what the rewards were posted at. I guess I wore them out.